Picture if you can, a baying Trent End crowd at Nottingham Forest’s City Ground in the late sixties and early seventies chanting the above to the tune of a clock chiming… As always, football crowds can easily identify those that can hurt their team the most, and so it was with Chelsea’s ‘Ossie’. This past weekend saw the second anniversary of the death of Chelsea and England centre-forward. Osgood was a supremely talented player in a team full of stars. 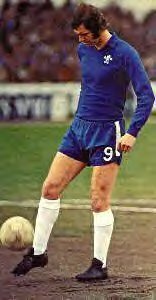 I was fortunate enough to see Peter Osgood play a good few times, both in his heyday with that fabulous Chelsea team featuring people like Charlie Cook, Bobby Tambling, John Hollins etc., and also at the end of his stellar career, at Southampton. Osgood was some player let me tell you. An unusual striker in the sense that with his low centre of gravity for a tall man, he had great ball skills and was a most graceful player. He also had a superb first touch of the football. he was also very stong physically and could look after himself in an era when there were a lot of hard men in the game and less protection for players. Although something of an arrogant-looking performer on the pitch with a languid style (aren’t a lot of the greats?) Ex-bricklayer Peter apparently kept the common touch and was also known to enjoy a good drink too. 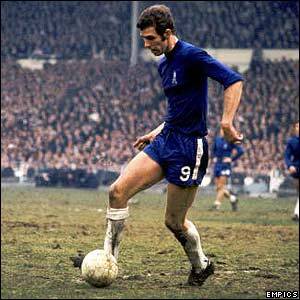 So remember the King of Stamford Bridge, Peter Osgood – another player for Heaven’s XI. Rest in peace, Peter – you were one of the greats.